Topic Tests for final 20 days? So I’ve completed approx 6 mocks (CFAI, 3 Schweser, 2 Fitch) and am thinking about the best strategy for the final days. Mocks are a great assessor of time pressures and performance under them, though I think I have this part nailed as I’m usually much quicker than 3 hours. I’m keen to get a full grasp of the wording of CFA tests - would hammering all 80+ Topic Tests be the best way to do this? I have old mocks too which are a mix of Topic Tests and non-relevant 2016 L2 questions. I did complete the TTs about 1.5 months ago, with the low scores as most of you also got - hopefully now I have the knowledge to get the 4.5/6 average. I am finding the Topic Tests on CFA website to be WAAAYYYYY harder than schweser. like….WAY harder. Has this been other people experience as well? If you havent yet, you should 100% do the topic tests. They will be better than Schweser/Fitch mock questions. I’ve found them to be harder…..by orders of magnitude. Yes, I’ve done them once, about 5 weeks ago. I’m thinking devoting the next 2 weeks to them instead of mocks. Would this be a good strategy? As I have said on multiple threads, i personally found the CFAI Topic Tests to be harder than the Schweser mocks by orders of magnitude. I finished Equity and FRA topic tests. I solved each one under strict time limits (gave myself 15 minutes/item set) and did not peer at my notes. total exam like conditions. Equity: 17 topic tests, 59/102 questions correct. Obviously…these arent passing scores, and I am scoring higher on Schweser mocks. I am BANKING ON THE FACT that everyone I talk to says tpoic tests are (MUCH) harder than the real thing. I HOPE this is the case. The FRA topic tests in particular is like swimming with pirhanans. Each and everyone you have like 3-4 exibits and each exhibit has 2-3 footnotes!!! Whereas the Schweser mock FRA item sets have 1-2 exhibits with modest notes. ON the tpoic tests there are a minimum of like 3-4 alterations that you need to make, whether it be lif0 to fifo…or ifrs to gaap, or reversing the effects of capitalized interest. BRUTAL. My advice to you is the same advice I am taking myself: do as many mocks as you can and be weary of taking too many topic tests, because the errosion of your confidence that may occur far excedes the benefit of extra practice. Or I could be totally wrong, what do I know, I never took level 2. Better to be challenged, and I found them to be quite similar to the prior year CFAI mocks. Also the importance of the wording of questions can not be overstated. Any time I read other problem sets it just comes off weird, CFAI is the best source of material. Indeed. I’m working through Schweser’s vol 1 of practice exams right now and the format and wording of their vignettes is really throwing me. It’s like I’m reading another language sometimes. I felt similarly about Wiley’s exams last year. Ah well, practice is practice. I haven’t done yet any Schweser mock, but I find that the CFA topics are very very diffcult. I remember that on level1 they were much easier and I didn’t have such difficulties like I am having now. Yepp. Level 1 was much easier. How did u find the Fitch mocks? Worth buying? I’m considering finishing Schweser very soon, then spending 2 weeks getting used to the style of wording by CFAI, using TTs. I hope to also be suprised by the less difficult nature of the actual test, though I hope my confidence is not shot! I’m worried that due to the difficulty of the topic tests, I might not learn anything just b/c of how hard it is to understand their answers. Would it be better for me to just do schweser qbank questions and just drill for the sake of memorization of concepts/formulas? No, I would do the topic tests over Qbank. They’re in vignette format and better simulate actual exam questions. In a way, they’re like a couple extra CFA mocks. The topic tests are from relevant past CFAI mock exams. Are you sure? topic test are from old mock exams, which are not old CFA exams. I have heard by some colleagues, that the actual exam is much easier than these topic test (at least when they gave the exam). There’s no evidence that the topic test questions or mocks are built from prior exam questions, for obvious reasons. But the topic test questions do seem to be built from prior mock exams and vice versa. For example, I know there’s at least one vignette in this year’s mock that was a topic practice question last year. If I were to take a wild guess, topic practice sets and mocks might be built from questions that may have been written for the pool of questions in consideration for an exam question, but didn’t make the cut for whatever reason. Maybe it took too long to compute, was potentially ambiguous or flat out too difficult. The last part might explain the general opinion that the topic tests and mocks are harder than the actual exam. I have done all of the CFAI Topic tests and 2016 Mock once (around 3 weeks ago). I have started Schweser practice exams but I find them difficult due to the wording and the way they ask questions as some other posters have elluded to it really throws me off. Would it be useful to finish the Schweser Practice exams or more valuable to redo all of the topic tests again?…struggling with what to do in the final 2.5 weeks! I have an impression that the questions in Schweser Mocks are designed to confuse canididate (he is forced to think like in that way” A is straightforward but never straighforward solution is correct answer, so the answer is B or C). This is not the manner of questioning that I find at CFAI. Due to time constraints ang only one official Mock, I am solving Schweser Mock each Saturday but within week I am practicing solely by solving CFAI topic tests and EOCs from the official curriculum. The way the CFAI tests are about is what I’d expect on the exam. If the real exam questions will be easier than Topic tests and CFAI Mock, the better since I have a margin of safety for pressure on real examination. This is factor in which I am never exposed while practicing at home. I would say start shopping for Champaigne. But I’ve found repeating blue boxes to be very helpful. Far more so than L1. My take on L2 is that the EOC / Topic Test / Mock are all basically at the same level of granularity. TT and mocks give you a more refined view of the exam experience, but they all ask questions that can be answers in 2-4 min. Blue Boxes teach you how the system works. Why is accounting one way and not another? Why is a swap like a bond? The best ones are like receiving a lecture on the theory underlying the topic. I am still finishing out Topic Tests, but will be supplementing these final days with key BB. Yeah running through the BBs on FRA, Equity and FI (and maybe Corp Fin and others if there’s time) is not a bad idea for the final week or so. Sometimes answering a question correctly depends on remembering where to start. Finding the starting point invokes muscle memory I think, and the BBs can help keep the process fresh. 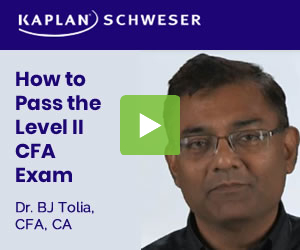 The second book of practice tests from Schweser are definitly closer to the CFAI mock. They start adding in the layers and tricks. Finished the 2nd AM one and the average score it said was 61 for people that have taken it already. It was almost the most difficult questions from every section of the test. They are harder for sure. I said in another post one of the questions I couldn’t find the answer in cfai books or Schweser books. @h21 – just finished Economics Topic Tests. Amazing how ignorant I feel. That was a strong subject for me in EOCs. Many passes. Topped out around 85%. Got 1/6 on an Economics TT. But across the lot of them, you get a real feel for what they’re interested in you knowing. Halberstram - I got a higher score in mock 4 schweser than mocks 2 and 3. This was in volume 2 - I found it easier.